Every weekend, if you can. (I can't. But I wish!) Or at least when you're feeling especially bogged down by your busy city life and all it's many obligations and noises and routines. When you feel like just getting back to basics and enjoying the simpler pleasures of life and filling your nostrils with the fresh, earthy scent of hay and manure. Go visit a farm. The other Sunday, I took a trip to Broken Shovels Farm. It's a tiny, rustic farm in Henderson, just a short drive from the city, and it has a wonderful, wholesome feeling to it as soon as you step on the grounds. There are lots of happy goats prancing around like they own the place (they do). Several of the sweet mama goats come up to you and lean in, like a big dog would, to be pat on the neck. This time of year the place is absolutely teeming with baby goats of every size, some tiny enough to hold. Which is the best. You might even be lucky enough to find one that is vociferous and you get to hear that weird but adorable bleat, which is also the best. Obe with his new best friends. All the many adorable goats aside, what's great about this place is that you can feel the love that goes into every aspect of their operation. The mamas know their names since the farm is small enough for Andrea, the goat farmer, and cheesemaker extraordinaire, to make sure they all have some individualized attention each day. The babies are allowed to nurse with their mamas, which means that Andrea is able to get less milk, overall, but the quality of the yield is incomparable. they even get to use this old car as their own personal jungle gym. And can we talk about the cheese? Broken Shovels makes the best chevre I have ever tasted. No joke. Bring it to room temperature and it takes on a light, fluffy and spreadable texture that tastes tangy but mild, surprisingly rich and luxuriously creamy. Not to mention her French Cherry flavored chevre with sweet cherries and herbs de provence and the many other chevre and sweet spread combinations she makes. I keep a tub of Broken Shovels chevre in my fridge at all times. I find myself mixing it into salad dressing, adding it to salad, crumbling atop some grilled or baked meat, mixing in my scrambled eggs, spreading on my bagel or toast, and just so many other things. Everybody needs some more chevre in their life. 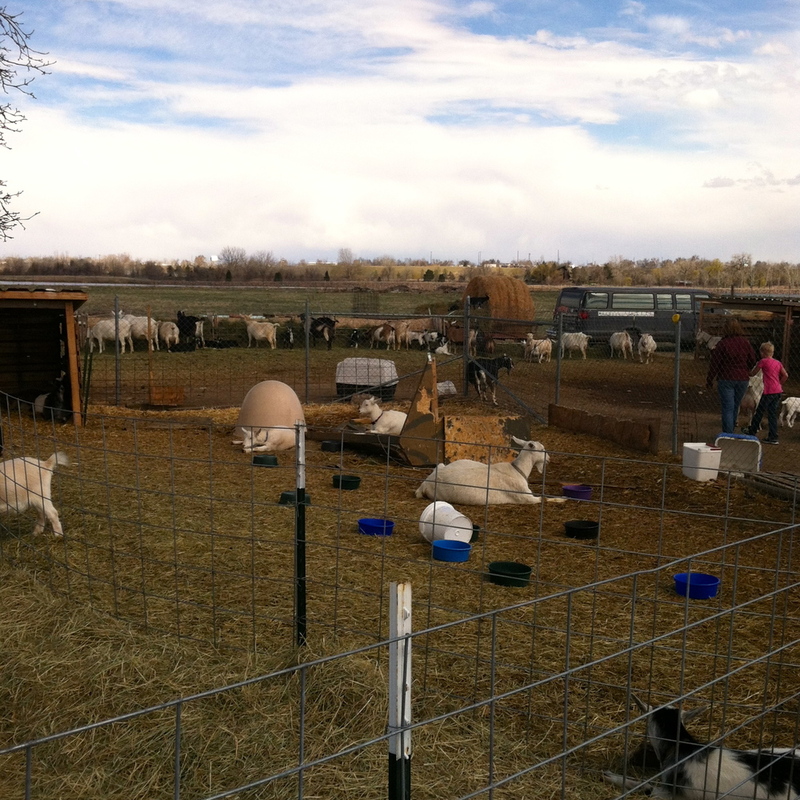 Especially when it comes from Broken Shovels Farm and the happiest goats in Colorado. this little girl is all smiles.